Ice and I got married in August, August 6, 2016 to be precise. August 8 at 12:30am we left for our honeymoon. We couldn't wait to celebrate alone. The wedding festivities were beautiful and special, but we were beyond excited to be on our own. We went for 2 weeks, spending our time in Bangkok and Phuket. I thought I'd share with you the highlights from our trip, in case any of you are planning an exciting getaway for yourself. First, several things to know about Thailand and our trip. Ice planned the whole thing, with only a little of my input. Be prepared to read a lot about we ate. The food was interesting, and delicious, so that will be a focus of the daily reflection. Thailand is expensive to get to. China Airlines is incredibly efficient. You will never have any patience for JFK or LGA airport after you fly with China Air. The specific memories I share with you are recounted from a "journal" aka the Notes app on my iPhone. I highly recommend doing this. There are so many things to remember about this time in your life, and the good stuff can get lost in the mayhem. Keep a journal, and write about the butterflies you feel when you are away and alone with your significant other. We arrived after just under 1 day of traveling. We were 12 hours ahead of NY. The jetlag was tough, but we had time to adjust as we pleased. How rare, right? Morning: Our flight was so comfortable. They gave us 2 full meals, multiple drinks, 2 snacks, and a pillow and blanket for everyone. From JFK to Tai Pei and from Tai Pei to Bangkok we flew on an enormous 747 plane. All flights were incredible comfortable, only my lower back was hurting a little - my feet were tingly. My feet were still swollen from all the dancing from the wedding! Afternoon: We pulled up to the Oriental Residence Bangkok , a beautiful Travelers' Choice 2016 Winner. The suite we stayed in had an enormous bathroom, king size bed, and TV area. After reveling in our luxury hotel, we headed out to do some shopping. We headed to Tony's Fashion House, to see if we could buy Ice a couple of suits. We had heard we could get custom made suits for a really good price, and so we did. The customer service was so nice, they gave us drinks as we entered and were kind enough to hold everything we ordered until we got back from Phuket 9 days later. Evening: We went to Eathai for dinner in the Central Embassy, which is equivalent to their high-end mall. We ate food from the various kiosks in the store, and had drinks out of coconuts! So cute and festive! Morning: Our sleep schedule was way off - we woke up at 3 in the morning. This was ok, because we were able to watch the American women's gymnastics team dominate for gold in the category of best artistic gymnastics! I was so happy to see such a diverse team - Black, Hispanic, and white girls crushing their respective specialties. A true team, able to represent the country as it actually looks and feels. Mid-morning + afternoon - We did some sight-seeing. We booked all tours through the Oriental Residence front desk - or rather, Ice did. We saw the Grand Palace, The Golden Buddha, and the Reclining Buddha. Lots of Buddha. The Thai architecture is very intricate and ornate. We learned there is a Buddha for everyday of the week, and when you are born on that day of the week, that becomes your Buddha. The weather was extremely hot and humid, which was amplified by the need to cover up in the temples and sanctuaries. We had to take our shoes off too. We were provided with a bag to put our shoes in. Abiding by the behaviors at the temples was extremely important. Breakfast: Singsong, our tour guide, introduced us to a typical Thai breakfast - this includes pork meatballs, rice soup, egg, ginger, scallion, and hot tea poured over ice. I was nervous to try the food, but It was delicious! We both ate at for $3 USD. I was so excited that Singsong showed us where to pick up the breakfast, and exactly how they ate it. I wanted that experience. I wanted to go across the world to FEEL like I was across the world. I wanted to be surprised and I wanted to be jolted a little. Thailand was on the list of vacations for these reasons specifically. Lunch - We had chicken, squid, and rice from local street vendors across the street from the hotel. Everyone picks up lunch from the vendors. They give you a small portion. Ice and I picked up 3 servings of rice, so American of us. The vendors' food was great. They just keep making food all day until dinner time. It's a long time to be standing out in the heat and making food. We didn't eat dinner. We walked around in the park in the area, and we went to bed early. Traveling around Bangkok is challenging due to the heavy traffic all over. The weather is HOT, they even provided cool towels for us at sites in the morning. We stayed close to the hotel to avoid the traffic and make the best out of our time there. There is an air-train that we didn't take, but supposedly this make it easier to get around the city. Morning: We watched the Olympics, men's volleyball was on. This, of course, was at 4am. I can't believe how strong Olympic athletes are. For breakfast we went back to the same market across the street. Ice picked a deep fried omelet over rice and fresh cantaloupe. We both highly enjoyed our breakfast, and we headed to the airport to leave for Phuket. At the airport, we found a Krispy Kreme kiosk where we found a lot of other Americans, we hadn't seen very many before then. After appreciating our doughnuts, we boarded the plane. We flew Thai Smile airlines to Phuket. Interesting Fact: Due to close proximity, there are many Australians that "take holiday" in Thailand, the same way Americans "go on vacation" to the Caribbean. If you and your significant other can afford to go crazy for your honeymoon, you should do it. Our private villa at The Shore was something out of a movie. My family and I traveled a lot growing up, and always stayed in beautiful hotels, but this - this was something else. It was an apartment really, without the kitchen. If you click on the photo to the most right above, you can see more pics of our villa! We were villa number 8835. We could walk down to breakfast or the lobby if we wanted to, but we could also call a cart to come get us. When we left, we would leave one of the turtles propped on our gate to let the hotel know if we wanted our room cleaned, or left alone. It was a very cute system. We ordered breakfast to be delivered to our room today! I can't even explain how amazing this was. The night before, before a certain time, we would circle what we wanted on a menu left for us in our room. We would leave it outside, and in the morning the boys would deliver the food to us at the time we requested They set the whole breakfast up at a table over looking our private pool. We could see the ocean too, as you can tell in the pictures. All of the villas face the water. The breakfast delivered wasn't skimpy either - eggs, bacon, potatoes, fruit, fresh juice of all kinds, coffee, etc. The breakfast downstairs in the restaurant and in bed was included as part of our stay at with the hotel. It rains a fair amount in August in Thailand; it's monsoon season. You could see the rains coming from our villa, or when we were sitting down by the beach or restaurant. This meant we were constantly on and off the beach, inside and outside the cover of the restaurant. The winds would be strong too, so the restaurant not only had top coverage for guests, but also on the sides of the restaurant where it was open to the outside. Today, we had decided to stay and hang out by the beach. The ocean was rough so we weren't supposed to go in, but we still did a little. We went into the town nearby to get massages later in the day. The place we went to was called, Tum Rub Thai. It was a small place on the main street outside the hotel. They charged us $12 each for the massage. I am not a massage girl, but Ice loved it. He wanted to go back, and he might have when I was asleep on the beach one day. There are other places you can go to also. This one seemed best for us. They actually make you take your shoes off before you go in, which felt strange to me. These little women that give the massages work hard to make sure your experience is good. They give you a whole hour of attention, which is a great deal compared to what they would have charged at our hotel. We attended happy hour at The Harbor on Day 4, as well. Ice and I had good conversation as watched the sun go down. What a beautiful view it really was?! Below, you can see how beautiful the sky was every night. The infinity pool on the deck, above the beach, made for such a calming and peaceful time away from the everyday craziness we had left in New York. We ate dinner at The Fisherman's Wharf, a restaurant at Katathani's Sister Hotel. It was an ocean front restaurant. I had another excellent Caesar salad with bacon, lobster tail and red snapper in lemon chili sauce. The red snapper sauce was super spicy but delicious! Ice had seafood bruschetta - a medley of fish on one plate. He loved it, and at the time, said he wanted to go back if we could. We did not end up going back, there were too many other good places to try! We forgot to order breakfast in bed, so we went down to breakfast at 7. It was buffet style, so we had anything we could ever want to choose from. It was delicious! We went back up to our hotel room early, and sat by our private pool for the whole day, until our private cooking class. Side note: While we were completely removed from the United States and our families physically, technology still brought pretty much anything we want to us. We had Wifi in the villa, and I was able to watch all of Fuller House on Netflix while we sat under the canopy or lounged in bed. I started watching Fuller House on this day. We had a cooking class on day 5 which was one of my favorite parts of the whole trip. We did the class through Kata Thai Cooking Class , we had a very, very valuable experience with our instructor, Sally. She picked us up at the hotel, and we went to the market to pick up our ingredients, and to see how the people of Phuket grocery shop. They buy most food fresh, everyday, and hardly ever cook in their own small places. It gets very hot, and they do not have a lot of space. The beach town is very crowded. We learned about so many fruits, vegetables, and meats. I didn't upload the pictures of most of the meat at the market. Let's just say Thai people are not shy about how they handle meat, and they do not waste any part of the animal they are cooking. All of this is on display at the market. Sally let us try the different fruits and vegetables too, telling us how often they are used, and how Thailand has the right climate for the food to grow appropriately. One of the most interesting foods we tried was a black hard boiled egg. It was an egg, but even the inside was black. Somehow, they boiled the egg with a tea bag and the tea bag changed the color of the egg. It was unique, and tasted just as it was explained. Sally took us to the kitchen, and we were given more ingredients and instructions on how to cook a few popular Thai meals. We cooked Green Curry, Tom Yum soup (shrimp soup) and Thai basil chicken. We chopped all of the typical Thai ingredients, and we each had our own cooking station. It was really delicious and fun! We eat a lot of Thai food here, my husband and I, so were really happy to have someone show us how to do it in our own home. We haven't tried it here in our apartment yet, we were a little tired of Thai food after 2 weeks of it, but we definitely will. We were able to ask questions while we cooked, and write notes on our instructions that we could take home. We were with one other woman too, which added a little flair to the experience. I would highly, highly recommend doing this if you visit Thailand, especially Phuket Beach. We chilled at The Shore today. We actually had an early breakfast in the room, and went and had a second late breakfast/early lunch at the buffet downstairs at The Harbor. A super strong monsoon came through, and started knocking down glasses as the restaurant. The change in weather was so quick and urgent, that it was almost fascinating to watch. We came back upstairs to the villa relaxed for a while, before the sun came out again and we were able to sit in the fancy chairs by the beach. Around lunch time, we headed to those fancy chairs, and they brought us little crudités, complimentary. The hotel offered a free cocktail making class which we took advantage of, and we stayed downstairs to watch the sun set. We had dinner at Chanadda at 7, a traditional Thai restaurant at the resort next door to The Shore. The decor at this restaurant was really cute. Elephant detail on the plates, and fancy booth dressing. For dinner, I had fried shrimp with chili sauce, and a stir fry chicken with cashews and spring onion for dinner - so delish! Ice had a salad - which funny enough - is not salad like Americans understand it to be. Ice's "salad" had coconuts and oranges with shrimp. The coconut looked like glass noodles. Then, he had fried fish for dinner. 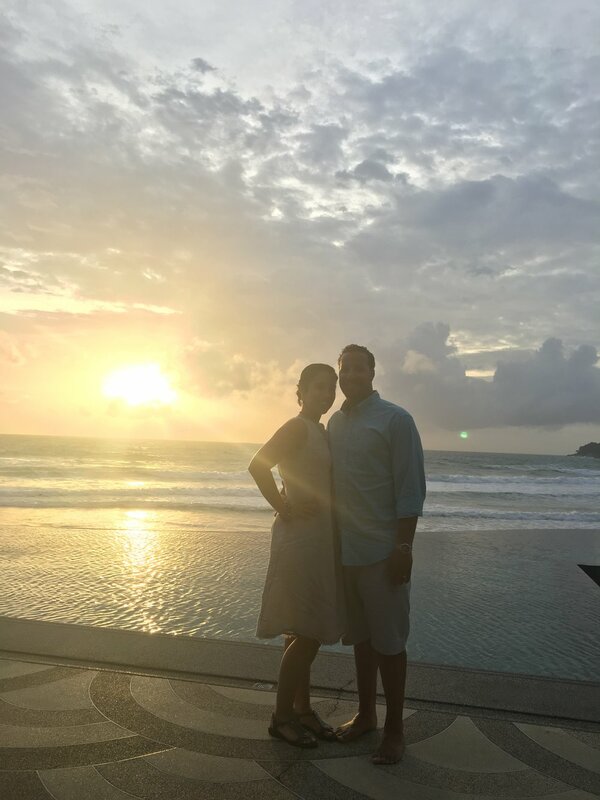 One week into our trip, we were feeling really happy and adjusted to the time difference. We woke up early on day 7 to get on a van to go see caves in Phang No Bay. We met up at a dock, with other people, and we boarded a boat with about 20 others. We spent an hour or so heading out to the middle of the Bay to get close to the caves. On the whole, the tour was well organized and efficient. I always appreciate that. We saw 3 caves. We would get off the big speed boat onto a 2 person canoe, plus a tour guide that spoke very little English. He paddled while we rode. We had to enter caves so low to the ocean water that we had to lay down in the canoe! Sometimes the caves were dark which was crazy. The tour guide would have a headpiece with a light on it, and he would wave the light over the ceiling where we could see bats sleeping. This was super cool, but also made me freeze in terror. In the first cave, we could get out of the canoe, walk around and take pictures. The water was shallow. We saw an interesting water frog/fish /animal, walking on the water. Isaac had to chase it to get its pic. The second cave was nice too. The water all around is a green color that is magnificent, as you can see in the pictures above. In side the cave, it was dark the whole way through. There was a snake in a tree. The tour guide said it was dangerous, and he pulled the canoe right up underneath the snake! I was nervous, Ice was in his glory. The caves have formed in shapes that resemble animals or humans. For example, one of the caves looks like it was formed in the shape of a dog. Before we got off the boat for the third cave, we were warned that there were monkeys in this cave. The tour guides said not to go near them. The third cave's opening was big, so we never had to lay down. It was pitch black inside. As we entered the center of the cave, where the sun shone through, we were with the others on the boat. Sure enough, the monkeys came out. One tour guide brought bananas to give to the monkeys, and of course, the monkeys jumped right onto one of our neighboring boats. I like to explore new places, and learn about other cultures. I am not a thrill seeker though, and the monkeys - they were a little too much for me. I did get lucky though, it poured, so we were able to go back to the mainland sooner than expected. The boat was prepped for this like I had never seen before. They had a cover, a plastic side panels to protect the guests from the rain. Those panels worked! I was so impressed! This was one of those adventures Ice tell me will be really fun, and then I forget to ask too many questions and I then end up in a cave with monkeys. We went back to the resort and had dinner at a little restaurant right off the resort, sort of by the massage place, called Siam Smile. This was the best dinner yet! We had golden prawns (fried shrimp) with sweet and sour sauce, seared tuna and the most amazing red curry chicken. I didn't even know I liked curry! We finally found the "drunken noodles" we order in the US at Siam Smile too. They were spicy though, Ice had to add chili pepper flakes to spice the food up! The pepper flakes worked! On the way back we stopped at a Walgreen's to pick up toothpaste. There was an eerie voice that said, "Welcome" in English as we walked in. We were laughing so hard when we heard it, I had to include the moment in my journal. Worth noting - everything in the store was labeled in Thai, it was kind of interesting to see all of the same brands and products, but labeled in Thai. We slept really late today, and woke up to go the buffet brunch, Eggs Benedict with avocado salsa and BBQ - sauce especially was so savory and flavorful. We also had dim sum with sweet and sour cocktail sauce. Monsoon rains came so we headed back to the villa. The villa was so big, with several different areas to sit in, making it easy to stay there for long periods of time without getting bored. A typical hotel room usually does not have those options. Today we didn't have anything planned. We just hung out and let the day take its course. Isaac went for a walk, I read a book on my phone. We headed down to happy hour at The Harbor, and we never left. This night felt like our honeymoon. Something about the sun setting just right, the wind blowing with just enough gust to blow my hair out of my face enough for me to see the light shining on everything. I felt hopeful and happy that Isaac and I really willbe great together. I also felt acutely like myself. I remembered that you can't be someone that your not, and people will come around in time. None of that means you have to change who you are. I really couldn't get over the breakfast delivered to the room, it felt really luxurious, special and over-the-top. The breakfast in bed option included whatever the chef's specialty was that day. Sometimes we were served these delicious creamy circular potatoes cakes that were so good, I could have eaten 100 of them. I never turn down a potato in any form to begin with, but these were THE BEST. We planned to see the Elephants today, through Siam Safari. 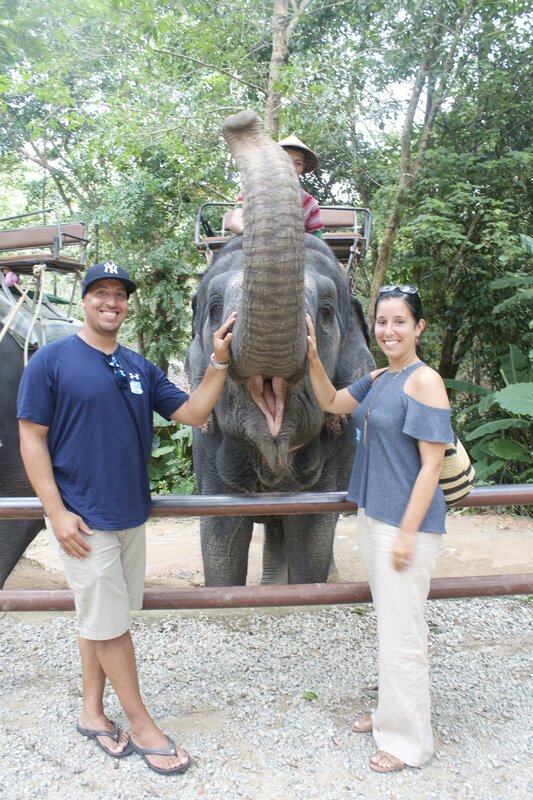 The elephants were right in Phuket, a popular tourist attraction for those on vacation. Our elephant's name was Jimlim. In order to get on Jimlim's back, we were elevated on a platform. The saddle was a medal chair on top of area rugs wrapped tightly around the elephant. It wasn't the sturdiest of saddles to say the least. I was a little scared to be on an elephant, but it was awesome. We had been looking forward to doing this since we left for Thailand. A little Thai man directed the elephant for us as we trekked through forest terrain. There were hills everywhere! The elephant went to the bathroom and scratched it's back against a rock during the 45 minutes we were on her. All of the elephants are females, males can be too aggressive for tourist attractions. We met a baby elephant, Spunok. She was great! We learned specific elephants were given as presents among royalty. Elephants used to give Thai people an advantage during war, not all countries had access to as large and sturdy a natural weapon, as elephants. For this reason, elephants hold great significance in Thai culture. We fed the elephants and took pictures with them. It was a short 1.5-2 hour excursion, but I loved it! We bought souvenirs in the store at the end and headed back. Ice, of course, found the toy that made the most noise. It was an elephant, and you blew into the wooden elephant's back side - the noise came out of the trunk (Insert eye-roll).We rode back in a wide open caravan with kids on it! There were no doors. There were seat-belts, but barely any protection from the outside. In NY, we could have never traveled like that, but in Thailand, nobody thought twice. Some words of advice: Wear shoes with a back on the elephant, because your feet might hang from the seat. Later in the day we returned back to the hotel. We hung out at the resort for a while, and didn't get out of our bathing suits until later in the evening. We had lunch from the street (pork sandwich on good bread and chicken sandwich on good bread with slushies.) We had one last beautiful happy hour and dinner by the ocean. Isaac boogie boarded, and we took pictures on the rocks that turned out to be sharp. We both cut ourselves. We returned to the room to pack and watch a movie. We watched a movie, in what was the MOST COMFORTABLE BED I HAVE EVER SLEPT IT. It was a great last night in Phuket, I was so happy and ready to come back to the US. Day 10: Left Phuket for Bangkok. We spent one more day in Bangkok, and we headed back to the US. Time to start our life together.